Elpida Memory, Inc (Elpida), Japan's leading global supplier of Dynamic Random Access Memory (DRAM), today announced that it has shipped samples of a 256 Megabit DDR SDRAM device that embeds Elpida's innovative Super Self Refresh (SSR) technology which achieves a dramatic, 95% reduction in self refresh current (IDD6) to extend the battery life for portable consumer electronics applications with no trade off in performance. Other applications may include automobile infotainment systems and server storage systems. These systems require both high performance and high density DRAM for multimedia processing, as well as low current consumption to preserve battery life. "Super Self Refresh technology is a fundamental advancement that will drive the expansion of DDR SDRAM into portable consumer electronics applications, because it enables a drastic change in scale for battery backup requirements," said Jun Kitano, director of Technical Marketing for Elpida Memory (USA). "By utilizing Elpida's DDR SDRAM with SSR technology, system designers can now decrease battery size, offer dramatically extended battery operation, or boost functionality without sacrificing performance." SSR is a new circuit technology which dramatically extends the internal refresh interval by working with embedded Error Correction Circuit (ECC), which checks and corrects the data when exiting the self refresh cycle. The SSR function simply replaces the self refresh that is familiar in conventional SDRAMs. Utilizing an on-chip temperature sensor commonly known as Auto Temperature Compensated Self Refresh (ATCSR), SSR also automatically adjusts the self refresh timing to compensate for internal temperature variations. Devices with embedded SSR technology require only minuscule self refresh current (IDD6), as low as 40µA (typical) at 25°C, 150µA at 70°C, and 250µA at 85°C. This is merely one twentieth of the current requirement compared with similar devices that do not include SSR technology. 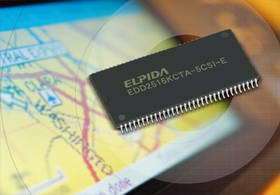 Elpida's new 256 Megabit DDR SDRAM devices with SSR Technology (Part Numbers: EDD2516KCTA-5C, EDD2516KCTA-6B, EDD2516KCTA-7A ) are organized as 4M words x 16 bits x 4 banks. They are JEDEC compliant, and they provide the same high-performance as conventional 256 Megabit devices with data rates up to 400 Mbps; 2.5V operation; a CAS Latency (CL) of 2, 2.5, 3 and a Burst Length (BL) of 2, 4, 8. Elpida builds the devices using its 0.11 micron process technology and they are available in a 66-pin plastic TSOP (II) package. Devices that support industrial temperature range (-40°C to 85°C) are also available. A 512 Megabit DDR SDRAM device with SSR, achieved through Elpida's Double Density Package (DDP) technology, is also available. Samples are available now and volume production is planned for March of this year. Please see pricing and availability schedule for detailed information.